In 1980, a company called Franklin Computer produced a clone of the Apple II called the Franklin Ace, designed to run the same software. They copied almost every detail of the Apple II, including all of its ROM based software and all the documentation, and sold it at a lower price than Apple. We even found a place in the manual where they forgot to change "Apple" to "Ace". Apple was infuriated, and sued Franklin. They eventually won, and forced Franklin to withdraw the Ace from the market. Even though Apple won the case, it was pretty scary for a while, and it wasn't clear until the end that the judge would rule in Apple's favor - Franklin argued that they had a right to copy the Apple II ROMs, since it was just a "functional mechanism" necessary for software compatibility. We anticipated that someone might try a similar trick with the Macintosh someday. If they were clever enough (which Franklin wasn't), they could disguise the code (say by systematically permuting some registers) so it wouldn't look that similar at the binary level. We thought that we better take some precautions. Steve decided that if a company copied the Mac ROM into their computer, he would like to be able to do a demo during the trial, where he could type a few keystokes into an unmodified infringing machine, and have a large "Stolen From Apple" icon appear on its screen. The routines and data to accomplish that would have to be incorporated into our ROM in a stealthy fashion, so the cloners wouldn't know how to find or remove it. It was tricky enough to be a fun project. 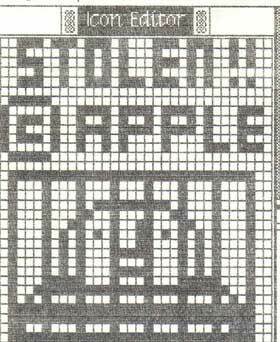 Susan designed a nice "Stolen from Apple" icon, featuring prison bars. Steve Capps had recently come up with a simple scheme for compressing ROM-based icons to save space, so we compressed the icon using his technique, which not only reduced the overhead but also made it much harder to detect the icon. Finally, we wrote a tiny routine to decompress the icon, scale it up and display it on the screen. We hid it in the middle of some data tables, so it would be hard to spot when disassembling the ROM. All you had to do to invoke it is enter the debugger and type a 6 digit hexadecimal address followed by a "G", which meant execute the routine at that address. We demoed it for Steve and he liked it. We were kind of hoping someone would copy the ROM just so we could show off our foresight. As far as I know, no one ever did copy the ROM in a commercial project, so it wasn't really necessary, but it did create some intrigue for a while. We let it slip that there was a "stolen from Apple" icon hidden in there somewhere, partially to deter people from copying the ROM. At least one hacker became moderately obsessed with trying to find it. Steve Jasik was the author of the MacNosy disassembler/debugger, which could be used to create pseudo-source for the ROM. He found out about the "stolen from Apple" icon pretty early on, and became determined to isolate it. He lived in Palo Alto, so I would occasionally bump into him, and he would ask me for hints or tell me his latest theory about how it was concealed, which was invariably wrong. This went on for two or three years, before he finally cracked it: I ran into him and he had it nailed, telling me about the compressed icon and the address of the display routine. I congratulated him, but was never sure if he figured it out himself or if someone with access to the source code told him. After reading this story, it came back to my mind what was done on late 80s in Brazil. I worked for a company called Unitron. On early 80s they were producing Apple II clones and became one of the largest computer manufacturers in Brazil. I even worked with one of their early Apple II prototypes, dating back to 1980 or 1981. So one day I found they were trying to clone the Macintosh, what they eventually did. I would need to dig around but I am almost sure I still have one of these machines at home. What I was wondering is if they ever caught the 'Stolen from Apple' routine/logo. The main engineer involved with the cloning project was brilliant and had an in-depth knowledge of the Mac hardware and software. But I have never heard about this logo so I am not sure if they were able to detect it or not. :-) Well something for the Mac history I guess. I would love to see this in action. Do you remember the secret address? Do you know which models it works on? I ran into Franklin at a trade show. I got rather heated since they had not only copied my design but also our PC board exactly. In front of some gathering people and press I asked why they didn't acknowledge me as their chief engineer. The Franklin president said that "yes" I was their chief engineer and I left, satisfied in that. In later thinking, I should have asked him where my paycheck was! wouldn't it be ironic if the [licensed] mac clones from the late 1990's still had this hidden ROM image? Did Apple ultimately win that lawsuit against Franklin? I've been trying to find documentation one way or the other. I know that Franklin won the first round - the court deciding that the copyright laws (at the time, of course) did not cover machine code in ROM, and that even if they did, Apple didn't have a copyright message printed on the chip. Then I found a page saying that the third circuit court overturned the decision, giving it back to the lower courts. But I haven't found any documents talking about what happened afterwards. I first used Macintosh in junior high school in 1989, and it didn't take me long to read somewhere that I could type "G 40E118" into the interrupt box of our Mac Plus to show a "stolen from Apple Computer" graphic. This appealed to me on a pointless novelty sort of level, and I showed it to everyone who would stick around long enough to watch. They didn't see what was supposed to be so great about this little icon that didn't seem to do anything else, but I was pleased by the idea that this result could only be achieved by jumping directly to a memory address, so much so that I still remember the memory location by heart all these years later, despite not having touched a Mac Plus for most of the intervening years. But I never knew the purpose of this icon until today, and it gives me satisfaction to finally understand. Franklin lost the suit over the original Ace machines (1000, 1200). Later they clean-roomed the ROMs and introduced a pair of machines that were only sort of Apple compatible. It had a BASIC very much like Applesoft, but lot of the internal ROM routines that Apple programmers relied on just were't where they would have been on a real Apple. However, they ran AppleWorks just fine -- AppleWorks barely touched the ROM. VTech had a more compatible approach for the Laser 128. Apparently they simply contacted Microsoft for a license to Applesoft BASIC, and Microsoft sold it to them! Apple's exclusive license to Applesoft, if they ever had one, had expired. That left them only having to clean-room the Monitor ROM, which was only 2K of code. Do you know anything about the Spartan? It was a small box, thw width, depth, and colour of a Commodore 64, but a little bit higher. It plugged into the back of the C64, using the game port, and possibly printer and IO ports, although it's been years since I used it and it wasn't mine, but my dad's. The Spartan was an Apple ][ plus emulator that used the Commodore's disk drive, monitor, and keyboard, but included its own RAM, ROMs, and 6502. Neat little setup, two computers about the same size and Apple //. Did they meet the same fate as Franklin? After reading this, I now know where the "no clones" idea came from!!! It is VERY disapointing to read this. I was a die hard Mac Fan all through college. I tried to obtain a Mac (a "cheap" one) when I started my career: as a high-school math teacher. In the school district where I taught, first year teachers made $19000/year: and most of that went to just living. This was in 1994-1995. There was NO way I could afford a $2500-$3000 Mac. But, luckily, I ran into PowerComputing and its brand of Mac clones. PowerComputing machines were cheaper and offered comparable performance, so I was able to buy one. This computer was going to be a "stop gap" for me: until I got a little more money in my pocket to afford a real Mac. I remember PowerComputing machines being advertised as the "Computer for the rest of us that the rest of us could afford". Boy, was that the truth. And, mine worked perfectly (dispite what many of you may have heard about PowerComputing machines). I loved the MacOS, but at the time, I could just not afford a true Mac and I was NOT going to go into debt over a machine that would already be obsolete before I even bought it. Then Steve killed the clone market, and I swore off Macs completely!! I just don't know WHY Apple did not take kindly to the cloning of their machines. Yes, there would be consequences to that effect, but which OS and computers are now the most popular? Windows and the PC: and one reason why is because IBM allowed them to be cloned. Apple, in the Mac, had a supperior product and OS that average fools like me could not afford. And instead of licensing,the design to other vendors for cheap clones, they expected the average person to go into tremendous debt over a computer that was even more expensive to own than to buy. Then, they sat on their laurels for the next 10 years and let Microsoft release a comparable product (which in many repect rules the world). In the end, this only shows me the root arrogance of Apple started at its core and was inbred in its employees. Because of all this, I must admit that while I love Macintoshes and think they are the supperior OS and computer system, I will NEVER again buy another Apple product. I swore them off in 1997 (the year Steve killed the clone market). After reading this story and realizing how arrogant Andy (and probably many other Apple employees) was at this time, I don't think I made a bad choice. And that is the same prevailing attitude many people have had for all these years. It is wrong. What started out as the IBM PC and Clones turned into the world's most popular personal (desktop) computer system. Why? because the cloning made it prolific, added competition, allowed for mass production which brought down prices. That is WHY one can buy a complete system (with most EVERYTHING the average user needs) for less than $1000. But, back in 1984, things were a little more "fuzzy". While the PC and its clones were emerging, there was no REAL dominant market share. Apple, which has always been boiling down systems that could be used by the modern consumer had just released a REVOLUTIONARY system in the Macintosh. It would revolutionize the way people would think and work with computers and even pushed development to new hieghts!!! But, again, there prices were WAY too expensive for the common user. This is when Apple should have opened up the market for clones!!! The most important concept at this time was NOT to be greedy--that could come along later. The most important thing at this time was to spread the Macintosh concept to as MANY users as possible. This is what IBM indirectly did, and it made Bill Gates the richest man in the World!! I am convinced if Apple did this with the Macintosh, wintel machines would NOT rule the world today, there would be more variety for the consumer and Apple would have a TRUE share of the personal computer market. This could have allowed (dare I say it) Apple to spin off a software division and make the OS separate from there hardware: a completely different and totally independant company. You are right: in the mid-90's, it was too late to clone the Mac market, since Apple had already lost the war. What I am saying is they would have had a GREATER fighting chance if they realized how to play the game in the beginning: numbers. I am always reminded of so many products that were better than the competition, but were beat out: the Comidore Amiga and Sony's Betamax to name just two. It appears from this story, that Apple Computer was more interested in ego than in spreading a marvelous computer system for the masses. In the end, they lost out. Just because you have a better product does NOT mean average consumers will buy it: you have to give them a REASON (financial or other wise). In 1984, the PC was cheaper and "good enough" for the average user to consider putting in their homes. I always like to share my opinion about the Macintosh with my coleagues: and it has not been wrong yet. In the end, the Macintosh is "...the computer for the rest of us that none of us can afford." Maybe that would be different if Apple allowed clones in 1984. Lou Rosas, you can buy a complete Apple Macintosh with less than 1.000$ (the eMac and the ibook. The Mac Mini isn't a "complete" computer, you need a keyboard, a mouse and a monitor). But the Macs are still more expensive than the PC clones (in Spain, the country where I live, you can buy a PC clone for less than 400&#226;&#130;&#172;, about 500$). And that's rigth, if Apple would have opened the platform to the clone market the Wintel platform wouldn't be the same. But in 1984, only Microsoft had the idea of an open platform with many compatible computers from a mirade of builders, because his bussines was (and still is) software. Apple people could be arrogant in those days, but everyone was arrongant. IBM people, Microsoft people, Apple people, HP people... everybody. The problem was Sculley was more interested in profits and high price for the Apple shares than the market share. Pedro Javier Mora, you have hit it "right on the nail!" (with the market share, that is). Yes, you can buy a Mac Mini for ~$500--without anything, but I was talking about 1984. But, my point was simple: Apple needed to gain market share early and there was no room for arrogance (even back in 1984). Ashot: I stand by my comments. I will call people arrogant if I think they are being arrogant: really. Ashot> The big difference (as mentioned above) is that IBM didn't own MSDOS so when they lost hardware sales, they lost their only revenue stream. Apple own their own OS, so as long as they had a decent licensing deal for sale of the OS to licensed cloners, they'd still take software revenue even if they lost hardware revenue. And most examples I've seen see significantly higher market up on software than on hardware. Whether you can maintain that kind of markup against people like Microsoft who practically give Windoze away to OEMs is another question. But then Apple would have had another battle - trying not to lose reputation over the terrible incompatibilities of different hardware. The one thing to be said about writing for your own hardware is that you can at least attempt to ensure that you support all your core components and retain a reliable OS without 3rd party hardware giving you a reputation for crashing and poor reliability (cf: Windows). All subject to opinion though. I FIGURED IT OUT MYSELF YOU A-HOLE!!! It is very easy for Lou Rosas and the other armchair quarterbacks out there to argue that Apple was greedy for "wanting it all" and not licencing the OS. It's easy to know the end of the story after you've read the whole book. What's less easy is knowing what to do at the time. When you are a character in the book, the ending is not so obvious. Also, when you're running a company, there are many pressures and constraints upon you. You can't just wave a magic wand and make big changes willy-nilly. Everything you do has a potential impact on whether you thrive or die. Every act has a risk associated with it, and every mistake you make costs you money. If a mistake is big enough, you go bankrupt. One last thought... Contrary to Lou Rosas' unstated assumption, the story is not over. If you take a longer term view of things, perhaps the choice not to licence was in fact the correct one. As I post this, Apple is worth $72.13B and Dell is worth $71.97B (market cap). Apple is worth more than Dell, and is growing faster than Dell. In the complicated series of steps that led to today, not licencing the OS was a significant contributing factor. Of course, you could compare them to Microsoft too ($289.43B market cap), but you could also compare them to Commodore ($0) or Kaypro ($0) or any number of others that didn't survive. I would say that the fact that Apple continues to exist and innovate is more of an accomplishment than some risky "could've been Microsoft" scenario. I've seen this on the Plus (40E118), but can someone confirm this made it into the Mac 128k or 512k ROMs? Ken, you seem to indicate this is the case. Using your method, however, I am having some difficulty producing the icon. Does anyone have the memory locations for these ROMs? I just noticed that there are seemingly unused bytes in the middle of the Font Manager (B564-B5B2 in the original ROM, right after the "Font Characterization Table" for the screen). What's that about? Is it another secret routine?